This entry was posted on March 17, 2012 at 3:46 pm and is filed under FILMS. You can follow any responses to this entry through the RSS 2.0 feed. You can leave a response, or trackback from your own site. I wasn’t aware of this series and hope to see it before too long. 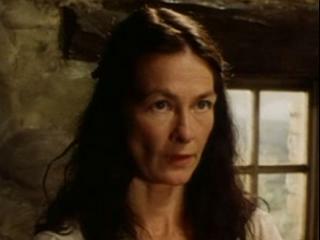 It was a horrible time for the Irish and should have brought shame to the English, and those of the Irish aristocracy. We sort of stumbled on it. I think you’ll appreciate the job done with the series. I’ll have to see if Netflix has it. Thanks for the recommendation. I have watched the series 2x. I loved it but saddened by such hardships the Irish People faced and today still face. I was just there and it is so beautiful and the people so welcoming. Fanad will always be in my heart! Maureen, thanks so much for sharing your thoughts. I’ve never been to Ireland (yet!) but I’ve traveled in Scotland and thought a lot about the Clearances. The survivors showed such strength they remain an inspiration for me. There are many poignant scenes in this series, but I don’t think I’ll ever forget the elderly parents walking away in the rain, with nowhere to go. I have just by chance stumbled upon this site. 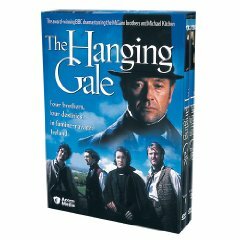 The Hanging Gale which I own on VHS is such a poignant film.I am of Irish parentage and have such empathy with the plight of my Irish ancestors.I would reccomend this film to be watched to try and understand what these poor poor wonderful people endured. I work in a senior school where the History Dept use my copy to show their A Level students,it never fails to to have an impact. Hi Kathleen – thanks for sharing. I can’t imagine anyone who watches The Hanging Gale not being moved by it. I’m glad it’s being used in your school. The story and visual elements are so powerful! And how especially meaningful for everyone who, like you, has Irish ancestry. This is a great film, and I bought it on Acorn catalog. I do believe you can buy it from BBC America too. 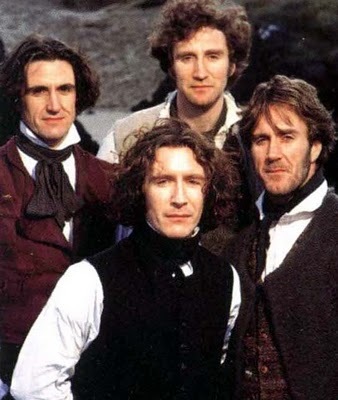 I love the McGann brothers, and have a great love of the Irish, Welsh and Scottish peoples. This film was heartbreaking. I cried and had to shut it off every now and then, and get back to it later, I didn’t feel much for the landlord. Thanks for sharing your thoughts. It is heartbreaking…but so beautifully done. Please feel free to recommend other films!